“Our goal is for every room and every tree to tell a story about who we are and how we gather around one another to mark the holidays,” first lady Michelle Obama said prior to the first public viewing of the 2013 decorations. While it was not the home of the first official White House Christmas tree, the Blue Room has held this honor since the family of President William Howard Taft lived there 1909 to 1913, according to the White House Historical Association. This year, the Blue Room is dedicated to U.S. military members and their families. 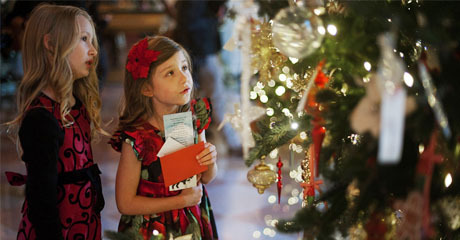 The tree is decorated with holiday greeting cards drawn by military children. The elaborate While House decorations are created with the help of volunteer U.S. residents. This year 83 volunteer decorators from around the country were chosen for the honor. The White House estimates nearly 70,000 people will view the decorations.